Winter is the season when leaves have fallen from the trees… when we clean the rain gutters, and prune back our roses & shrubs. Gardens and landscapes seem a bit lifeless as they wait upon spring. I still love the winter garden. As I prune and rake, I find delight in the plants that are still full of color, either in their foliage, or in persistent blossoms they continue to share. hugging rosettes, to tall and stately trees, and when they bloom; their blossoms are lush with color. As an added attraction, Hummingbirds love them. 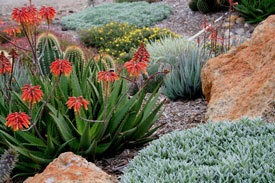 affect color change with temperature change or stress from drought. 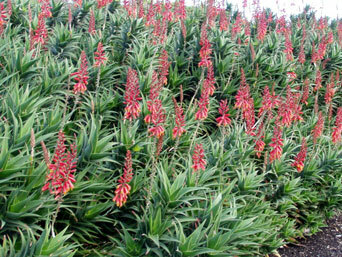 After years of observing Aloes, I can say they provide a powerful impact to the landscape through both structure, and color. The uniqueness of their vast and wondrous varieties almost seems endless. 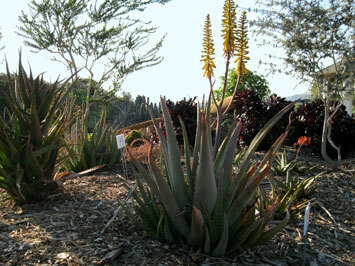 The Aloes shown are just a few of your choices. Explore & discover more options on our website with descriptions and photos. 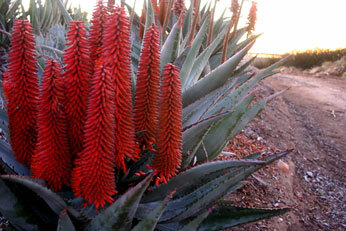 This winter, light up your landscape with “Amazing Aloes”. 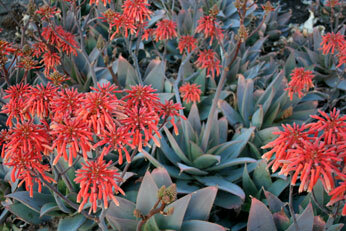 Come for a visit here at Waterwise Botanicals soon. We are here for inspiration in the garden.